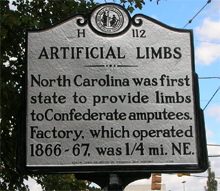 On June 18, 1867, the state-run artificial limbs factory in Raleigh closed due to a lack of business. The state had been operating the plant through Jewett’s Patent Leg Company for about 18 months in order to fulfill the needs of the state’s Confederate amputees. North Carolina was the first of the former Confederate states to offer artificial limbs to its maimed citizens. The temporary factory was set up in Raleigh near a railroad terminus. A system was developed whereby the amputees bore no out-of-pocket expenses in visiting Raleigh for prosthetic fittings. During the operation of the artificial limbs program, 1,550 Confederate veterans contacted the state for help. According to records in the State Archives, the total cost of the program to the state was over $81,000. After defeat, the loss of thousands of lives and economic ruin, the state’s citizens still had the ability to achieve something noble by repaying, to a degree, those who had literally risked life and limb. There are two Jewett legs on display in North Carolina. One is in the visitor’s center at Bentonville Battlefield in Four Oaks. The other is at Fort Fisher State Historic Site in Wilmington.